Today’s IT Management is faced with a daunting task to do more work with “less resources”. Whether the less resources means fewer human resources or less budget or less computer equipment the point is that in today’s market you need to squeeze every last penny out of the budget to achieve your workload. So, if you could identify a major leak in your IT budget wouldn’t you want to plug that hole and apply those resources where you need them most? Both Forrester and NCC conducted separate surveys about today’s IT budget. 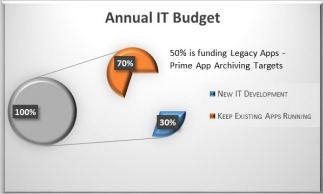 According to their surveys, between 60%-70% of the IT budget is consumed just to keep existing applications running. That leaves only 30% of your IT budget for new strategic projects to keep your company on the cutting edge and allow you to maintain that competitive advantage. Every company has applications that they have to keep running, that is a given. However, what is interesting is that of the 70% spent on existing applications, only half of those applications should be maintained in their current state. The remaining applications are legacy applications that should be archived. So, what does it mean to you if you could save 35% of your IT budget? If you are running on a $100M annual IT budget, you could potentially save $35M annually, which could be applied to other efforts in your IT Department or elsewhere in the company. Why let that $35M escape your control? The question that should be forming in your mind is how do you save this money if you can’t shed those legacy applications? Application Archiving is the answer to your question. Who should perform Application Archiving? The short answer is everybody. Application archiving cuts cross all industries. In today’s market where everyone is tightening their belt and resources have to support multiple initiatives you have to work smart to survive. 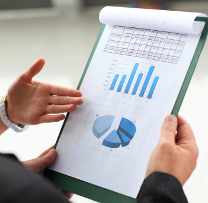 Application archiving helps you to free up IT budget by reducing support costs. It also frees up your valuable resources from having to support unnecessary applications. In addition it helps to reduce the impact of brain drain caused by an ever changing workforce that is either retiring or moving on to new opportunities. The following are just some of the areas where Application Archiving has a very strong play. M&A Mergers and acquisitions are always a prime target for application archiving. Acquiring another company always has some redundancy in applications between the two companies. The IT support cost to maintain redundant applications is very expensive. You may no longer need these application because you have a similar application already in your portfolio but you can’t throw it away either because you have to access the data. Application archiving provides a way to consolidate these applications to a homogenous compute stack; therefore, reducing the IT spend while still preserving the data so it can be queried and displayed via user friendly query screens. Free Trapped IT Budget and Human Resources Today’s market is ultra-competitive and therefore unnecessary spending of your IT budget is preventing you from being as competitive as you possibly can be. Not only are support costs for legacy applications costing financially, they are also diverting that capital from being spent on new critical initiatives. They are consuming your valuable IT Technical resources and keeping them from working on those strategic initiatives that keep you being a leader in your industry. Application archiving can free that IT budget so it can be applied to those strategic initiatives and it can free up those valuable IT Technical resources to work on the more important things. Eliminate Technical Debt “Technical debt” is a term that describes how legacy applications grow in complexity over time. This is due to several factors including adding new features to the legacy application, or technology changes, or rolling the application to an enterprise deployment and therefore increasing the hardware footprint. All of these factors increase the technical debt. According to Forrester, technical debt is costly and should be shed as much as possible. Application archiving can help you shed that debt, reduce the support costs, and free your IT budget for more strategic initiatives. Changing workforce The workforce that developed the legacy application is aging and is moving on to other department or possibly may be retiring. How do you support the old technology when that expertise (brain drain) is no longer available? By performing Application Archiving, pertinent information about your application is obtained now while there are still resources around who know the application. The application is moved to a new platform that future proofs the data and provides a UI that is very flexible and portable. Even if your workforce is still around supporting that legacy application then once the application is archived those resources can be applied to support new development efforts or support other applications. Extend Data Center Life Data Centers are very expensive and they take a considerable amount of planning to get the capacity, power and cooling strategy correct. By conducting Application Archiving, you can reduce the strain on your data center and free up space that can be used for new strategic applications. Application Archiving will allow you to get more life out of that existing data center and can give you that extra bit of time you need to do a little more planning before you have to incur the cost of a new data center. Reduce Cloud Costs Moving to the cloud is an expensive endeavor, so let’s reduce what has to be moved before you move it. Archive applications first and then move what is required to the cloud. No one packs their whole house up when they move to a new home. They thin out first and consolidate. Why take the useless clutter if you don’t have to. The concept is similar for IT Organizations moving to the cloud. Why not shed the applications and infrastructure that you don’t need before you move to the cloud or at least consolidate it to a homogenous stack that costs less to operate. Application Archiving is a process to reduce your hardware, software, maintenance, and labor costs for your legacy applications. Imagine still having access to your legacy data without having the associated cost burden. Being able to flip your IT budget from an ANNUAL 60- 70% support cost to keep applications running to only a 30-40% Annual support cost is amazing. Now with 60-70% of your budget available you can provision more strategic IT initiatives or fund other business endeavors. To learn more about this powerful budget freeing process, please contact us at truSYZYGY. We will be happy to discuss with you how application archiving can help your business.